I often talk about my stacks of inspiration notebooks where I keep years of old magazine pages, imagery, you name it! I often flip through them to gather inspiration for loving. living. small., apartment therapy and other projects I am working on. In fact, these little books are what encouraged me to start a blog. Since they are hidden away in books, I started blogging some of images I keep in here and it not only keeps them fresh and relevant but provides a new place to house them. I am a big believer in keeping old mags - love flipping through them and stacking them and all that good stuff. Consider starting your own inspiration book and enjoy! Excellent IDa...any tips on organizing/de-cluttering while keeping them? definitely keep the titles you really enjoy flipping through. I slowly narrowed my collection to 4 titles and keep them placed on a bookshelf in vertical magazine folders from ikea. I am bummed I got rid of all my Vogues during a move a few years ago (as your collection grows, you'll see how heavy mags can be in piles) so keep what you really like. plus now they make a neat design element in my home. While the inspiration notebooks house tons of pulled images and tears, i still keep the entire magazine. I cut out and kept only the pictures I liked and put them into a photo album, with each page holding various images, back and front. 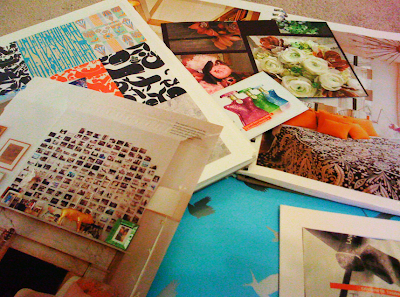 I now have two photo albums full of favourite decorating/product images...easy to move with and easy to store!